Lynda has over 25 years in the housing industry and 20 years as a licensed Realtor and Associate Broker. Lynda is also a Broker of her own company. She is a member of the Bay County Realtor Association, Michigan Association of Realtors, National Association of Realtors, a Graduate of Realtor Institute and has achieved Gold, Silver and Bronze Club Awards since 2000. 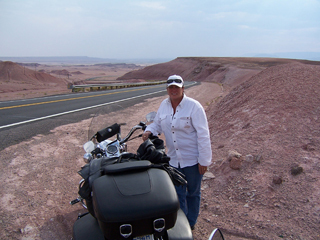 For Lynda Booms, there are few things in life that rival the excitement of taking off down the open highway on her Harley. "Riding is my passion," Lynda says. Born in Bay City, its seems Lynda was brought up with a need for speed. She simply admits, "I love to go fast." "It's a stress reliever and my ultimate getaway." Helping Buyers and Sellers with real estate in Bay, Saginaw, Midland and Arenac Counties MI, Mich., Michigan and following cities/townships within Bay County: Bangor, Monitor, Bentley, Garfield, Mt. Forest, Beaver, Bay City, Auburn, Essexville, Pinconning, Frankenlust, Kawkalin, Williams, Linwood, Bangor, Merrit, Hampton, Fraser, Crump, Munger, Portsmouth, & Rhodes; and following city & townships within Saginaw County: Hemlock, St. Charles, Cheasaning, Merrill, Saginaw, Freeland, Reese, Frankenmuth, Birch Run, Bridgeport, Saginaw, Thomas, James , Montrose, Buena Vista, Zilwaukee, Tittabawassee, Marion Springs, Swan Creek, Whitney, Kochville, Carrollton, Oakley, Brant, Richland, Albee, Maple Grove, Lakefield, Taymouth, Spaulding, Burt, Fremont, Jonesfield, Mario, Chapin, Lakefield, Brady, Blumfield, Frost, University Center, and Breckenridge; and the within Midland County: Mt. Haley, Curtis, Midland City, Midland, Jasper, Warren, Greendale, Homer, Mills, Chippewa, Billings, Ingersoll, Lee, Lincoln, Edenville, Tobacco, Jerome , Sanford, Coleman, Oil City, Hope, 48706, 48708, 48611, 48723, 48623, 48631, 48640, 48642, 48634, 48634, 48652, 48650, 48747,48626, 48655, 48616, 48637, 48602, 48457, 48724, 48649, 48614, 49083, 49417, 48301, 49250, 49245, 48615, 49820, 48642, 48640, 49248, 49245, 48742, 48620, 48657, 48618, also helping For Sale by Owner, FSBO, woods, wooded, hunting property, hunting, deer, pheasants, waterfront, and water front.